Home Quinceañera Archives Chávez is now an embarrassment…to Sean Penn! Chávez is now an embarrassment…to Sean Penn! Seven years into his rule, Hugo Chávez, the man shutting down dissident media at home, became the darling of the progressive left around the world - with lots of help from famous friends along the way. 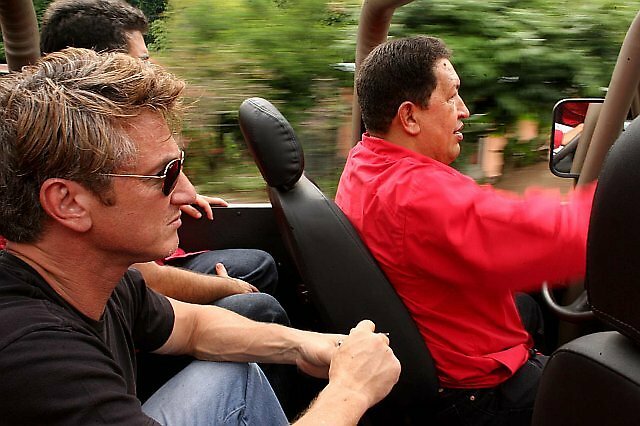 Perhaps your 2007 visit to Venezuela has been forgotten, Sean Penn. Thankfully, the internet is forever. This post was originally published on March 4, 2011. Pity Sean Penn*. After years working to position himself as an avant-garde progressive willing to push the envelope by hitching his brand to Chávez’s, his pet revolutionary starts unravelling all that work by standing by the mass-murdering Libyan regime. As Chávez starts spinning wild tales of gringo conspiracies to grab Libyan oil fields that aren’t even compatible with the wild conspiracy theories Gaddafi himself is spinning, I just have a mental image of Penn watching the news back home and just letting his face sink into his hands: ¡que torta! He’s now in Caracas, apparently trying to do a bit of damage control. Sean, buddy, it’s too late. The whole world’s borne witness to the twisted spectacle of one mentally disturbed pseudo-leftie dictator standing by another. Not even Chávez’s own bought-and-paid-for journalists can stomach it. In refusing to call out Gaddafi for plain old undisguised mass murder, Chávez crosses a new rubicon. It’s not that he’s putting himself beyond the pale of mainstream international opinion: he did that long ago, when he started shutting down dissident media outlets like RCTV. So we’re way past that. Now, though, he’s making himself radioactive even to the 1% farthest left fringe of international public opinion: Chávez is now beyond the pale of people who initially put themselves beyond the pale by supporting him! Psychopath autocrats of the world, unite!